It is the world's largest Buddhist stupa. It's ten stories high and measures over 120 meters (400 feet) per side. It was constructed around the 8th century and, centuries later, was abandoned. Eventually, accumulated dirt and volcanic ash half buried Borobudur and wild vegetation covered the rest. A British colonial officer came upon the semi-hidden ruins in 1814. A minor restoration was made in the early 1900s. However, it was never repaired to a respectable degree until 1984, the year UNESCO finished its decade-long project. 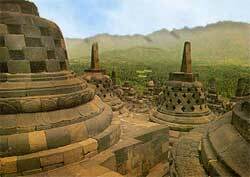 Borobudur was literally taken apart and reassembled stone block by stone block. 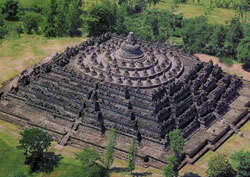 Borobudur has nine concentric terraces. The six bottom ones are square, the three top ones are round. The square terraces are trimmed with over 1000 Buddhist relief panels. They depict Buddhism scenes and are the site's greatest treasure. I spent a long time admiring them. The round terraces are garnished with over 70 bell shaped stupas (see photo). Originally, each housed a statue of Buddha (and some still do). Buddhist pilgrims have a praying ritual. The worshippers walk clockwise around Borobudur, one terrace at a time, starting at the bottom. Reaching the top of the monument is symbolic of attaining Nirvana.